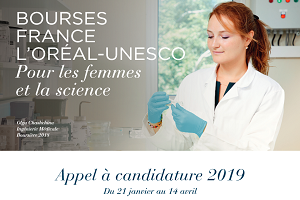 The L’Oréal Foundation, in partnership with UNESCO and the Academy of Sciences, is pleased to announce the opening of the call for applications for the 2019 edition of the French Fellowships l’Oréal-UNESCO For Women in Science. Created in 2007, this program aims to reveal and reward talented young women researchers. A total of 230 young women received a French Fellowships l’Oréal-UNESCO For Women in Science. € 20,000 each to postdocs. Find more information and submit your application by clicking here. Deadline for submission of applications: Sunday, April 14, 2019.